Irrigation water management is an important process that requires basic understanding of principles and relationships of water, soil, air and plants. Though these principles are well-defined in standards, literature and by various professional societies and associations, they are not always customarily used by irrigation practitioners. The concepts and terms presented in this article are described so that all irrigators can speak the same language. Saturation (θS) – The maximum amount of water stored in the soil (Fig. 1). The total volume equals the volume of water and soil particles with no air space within the soil column. Drainage from gravity will occur until equilibrium is reached. Flooding occurs when additional water exceeds the saturation point. Field capacity (FC) – The maximum amount of water that can be held in the soil without drainage due to gravity (Fig. 1). Generally, field capacity occurs about 48 hours after saturation, but varies based on soil type. Permanent wilting point (PWP) – The minimum amount of water held in the soil (Fig. 1). Plants do not have access to this water, and permanent damage begins before approaching this point. Plant available water (PAW) – The total amount of water that is available to the plant. This value is the difference between field capacity and permanent wilting point (Eq. 1). Maximum allowable depletion (MAD) – The portion of plant available water that can be depleted before irrigation is required. This is considered to be a trigger point. Readily available water (RAW) – The portion of plant available water that can be used easily by the plant resulting in minimal stress. Irrigation should be scheduled when readily available water is depleted. For a turfgrass, readily available water is usually 50% (MAD = 0.50) of plant available water (Eq. 2). Root Zone – The depth from the soil surface to the deepest root of the plant. For agronomic crops, the root zone increases throughout the growing season from only a few inches after planting to several feet by harvest. When soil water holding characteristics are given as a percentage or unitless fraction, they should be multiplied by the root zone depth to determine the amount of water associated with that characteristic. Infiltration Rate – The rate that the soil accepts water from the surface. It can be affected by soil type, slope and the amount of water already in the soil. Soil Water Balance – The method of keeping track of the inputs (sources), outputs (sinks) and storage of water in the root zone based on the principle of mass conservation (Fig. 2). It is commonly referred to as the checkbook method due to the similarity between balancing a checkbook and accounting for changes in water movement within the root zone (Eq. 3). Evaporation – The amount of water removed from the soil surface by an energy source such as solar radiation or wind. Transpiration – The amount of water taken up by the plant from the root zone and released through the tissue of the leaves. Evapotranspiration (ET) – General term for the total water leaving the root zone due to the combined processes of evaporation and transpiration. Reference Evapotranspiration (ETO) – Evapotranspiration from a uniform surface of dense, actively growing, well-watered grass (short) or alfalfa (tall) material maintained at a height of 0.12 m or 0.50 m, respectively. The value is determined as a function of weather (Eq. 4). Crop Evapotranspiration (ETC) – Evapotranspiration that is specific to the crop being considered for irrigation. It is typically estimated by multiplying reference evapotranspiration by a crop coefficient (Eq. 5). Crop coefficient (KC) – Average ratio of crop evapotranspiration to reference evapotranspiration. Crop coefficients are regionally dependent due to variations on plant type, soil type and weather considerations. Total Rainfall (R) - The total amount of precipitation that fell from the sky. This would be considered as the depth or volume measured with a gauge. Net Rainfall (RN) – The amount of precipitation available to infiltrate into the soil considering inefficiencies such as canopy interception and surface runoff. Effective Rainfall (Re) – The amount of precipitation that is actually stored within the root zone considering storage space and infiltration rate. If the soil is at or above field capacity, effective rainfall is zero. If the soil is below field capacity and at a rate less than the maximum infiltration rate, the effective rainfall would be the amount that brings the soil water level to field capacity. Plant Water Requirement (PWR) – This is the total amount of water required by irrigation to supplement the water needs of the plant material. It is calculated as the portion of the difference between crop evapotranspiration and effective rainfall that can be stored within the root zone. Net Irrigation (IN) – The amount of irrigation that is required to meet the plant water requirement. Irrigation Efficiency (IE) – Factor that takes into account the uniformity and efficiency of the irrigation system. When an irrigation system is less efficient, more irrigation should be applied so that the needed amount will reach the root zone. Typical efficiencies for furrow irrigation are 30% to 70% and center pivot are 70% to 90%. Gross Irrigation (IG) – Total amount of irrigation that should be applied so that net irrigation reaches the root zone (Eq. 6). Gross irrigation increases as irrigation efficiency decreases. Effective Irrigation (Ie) – Amount of irrigation that reaches the root zone. In ideal situations, net irrigation and effective irrigation are equal. Surface Runoff (RO) – Amount of water that fails to enter the soil profile, leaving the system by surface flow. This occurs when the rate of rainfall or irrigation exceeds the infiltration rate of the soil. 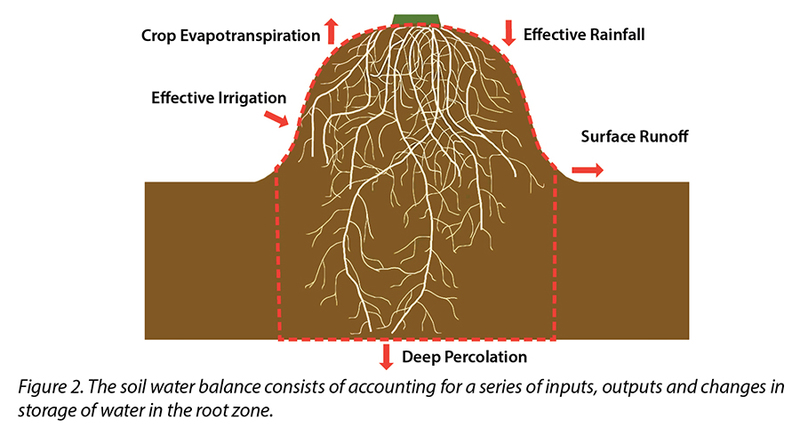 Deep Percolation (Pd) – The movement of water outside of the root zone as it moves deeper into the soil profile. This term can also be referred to as leaching. Upflux (U) – The term for upward water movement due to a shallow groundwater table. This is common in coastal areas or in areas with shallow restrictive soil layers. Gravimetric water content – A measurement of the amount of water in the soil, calculated as the weight of the water compared to weight of dry soil. The method of calculation involves collecting a soil sample from a desired depth and area of the field, weighing the sample, oven-drying the sample (preferably for over 24 hours) and re-weighing the sample. The difference is the weight of the water within the soil. This method gives the gravimetric water content in weight of water per weight of soil (Eq. 3). Volumetric water content – A measurement of the volume of water compared to total volume represented as soil, water and air. 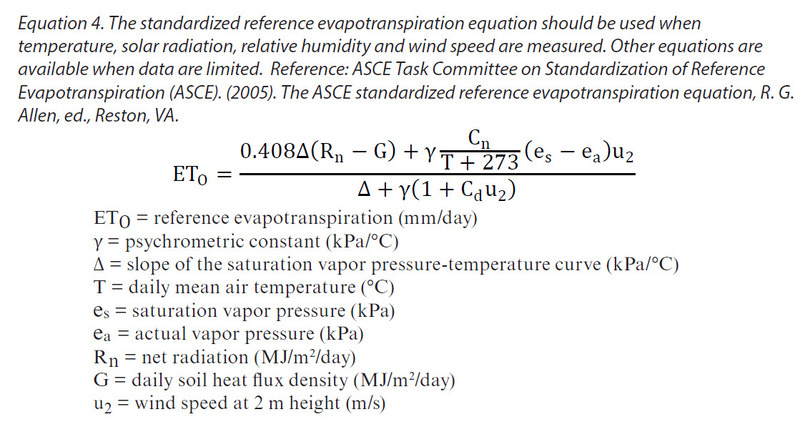 This calculation method gives soil water content in volume of water per volume of the soil column (Eq. 4). Another way to determine the volumetric water content is to convert from gravimetric water content using the bulk density (Eq. 9). These terms were presented using the most common name, but may be represented as a number of different variations. For example, permanent wilting point may be referred to as the wilt point or wilting point in many references. If you need help deciphering terms, please do not hesitate to contact your local parish extension agent or Dr. Stacia Davis at SDavis@agcenter.lsu.edu.